We learned there is plenty to keep people occupied in Southwestern Oregon. 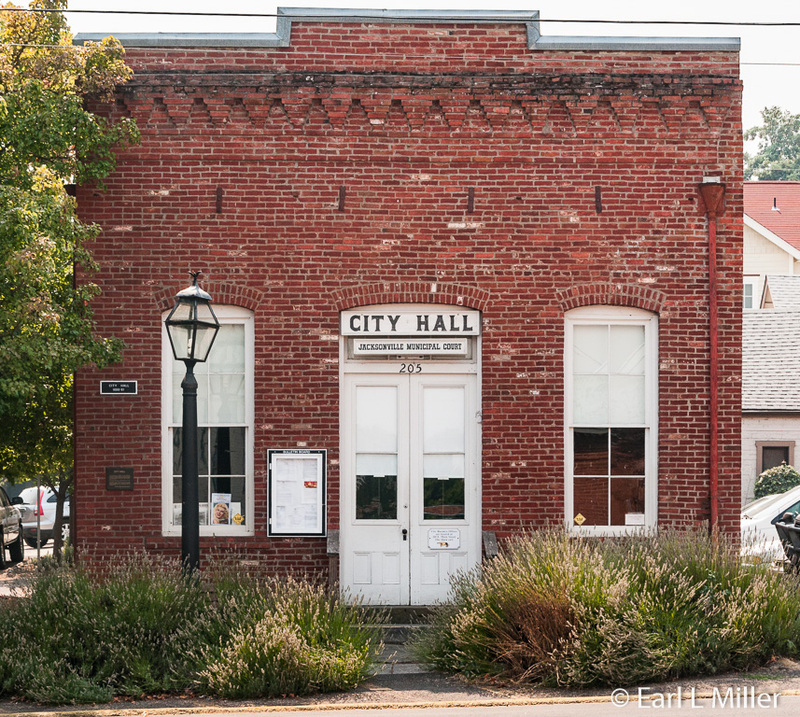 This article will be onTalent’s Camelot Theatre Company, the city of Jacksonville’s trolley tour, and Cave Junction’s Siskiyou Smokejumper Base Museum. Ashland, south of Medford, is known nationwide for its summer Oregon Shakespeare Festival. However, tickets must be reserved well in advanced and are pricey with tickets in the $80+ dollar range for good seats. We decided to skip that and find some good semi-professional theater instead. In August, we found a quality theater in Talent, five miles north of Ashland, and spent the evening at Spotlight on Perry, Jerry, & Dean. It was a show interspersing the biographies with the music by Perry Como, Jerry Vale, and Dean Martin. In all, 25 songs were presented. The performance was superb. Depending upon the show, if we were in the area again, we would attend another. Founded in 1982 as Actors Theatre, this playhouse opened in 1990 in a onetime feed store that had been converted to a 104-seat theater. It met with varying degrees of success until Livia Genise became the Artistic Director in 2002. Genise had performed throughout the country as Rizzo in Grease, from Broadway to Hollywood, and guest starred in Hollywood on such television shows as Three’s Company to Hill Street Blue. She also had a four-month stint on Days of Our Lives. In 2007, the Talent Urban Renewal Agency planned to extend Main Street through the location of the current theater building. Camelot successfully raised $2.5 million to purchase land and create a new theater building. They moved into a new state-of-the-art structure seating 164 in 2011. The theater presents different types of productions. Their 2016 season lists four musicals, three plays, four spotlights on performers, and music presented by the Conservatory. The spotlights trace the lives and music of types of music or major performers. This year they are on Kenny Rogers, Simon and Garfunkel, Judy Garland, and musical theater. The musicals will be La Cage, Sweet Charity, South Pacific, and Legally Blonde, the Musical. When gold was discovered at Daisy Creek in Jacksonville, Oregon in 1851, prospectors flooded the area. 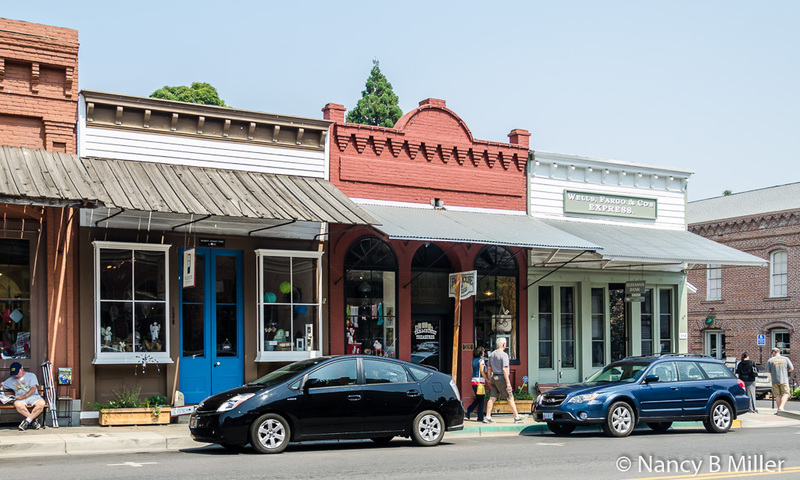 Originally called Table Rock City, the town quickly grew into Jacksonville, the largest town in the Oregon Territory and the hub of commerce in Southwest Oregon. Before then, the Upland Takelmas, a native American tribe, as well as trappers, inhabited the area. The massive influx of white settlers caused severe friction and led to the removal of the native populations from the area. In 1884, the railroad bypassed Jacksonville. The boom was over and businesses and residents moved away. Many relocated in Medford over the next fifty years. In 1966, the U.S. Department of the Interior designated Jacksonville as a National Historic Landmark since many buildings had been preserved. 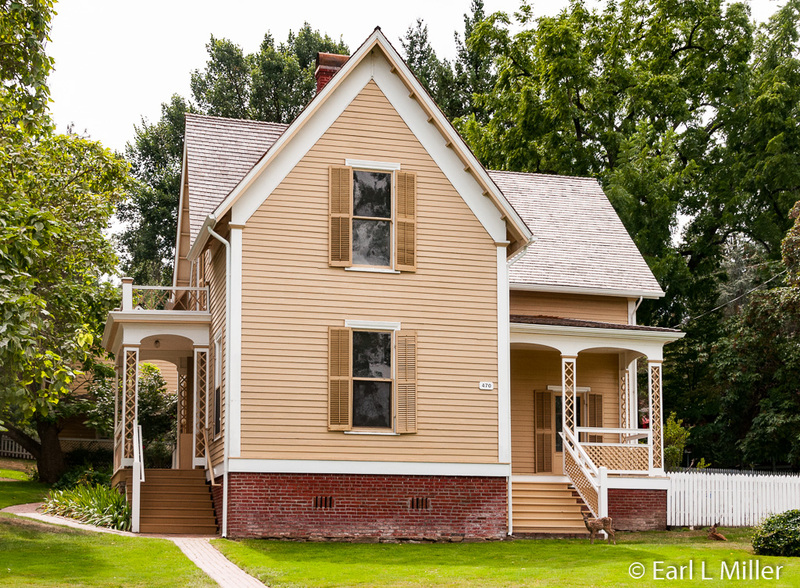 More than 100 structures are included in the National Register of Historic Places. On a narrated 45-minutes trolley tour, you can visit this historic town and get a vision of the Old West. 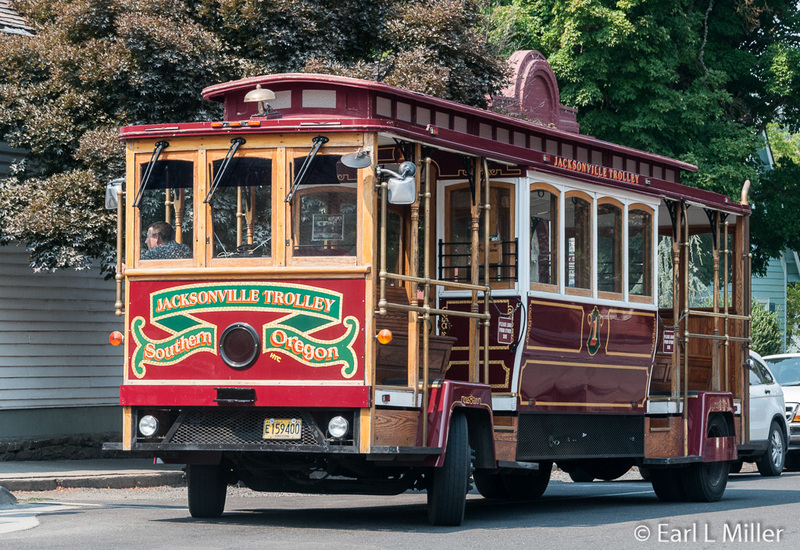 The city owns the Jacksonville Trolley. It’s sponsored by the local merchants on behalf of the Chamber of Commerce. The trolley runs daily from May through September, offering tours departing at 11:00 a.m., noon, 1:00 p.m., 2:00 p.m., and 3:00 p.m. It runs weekends in April and October. The fare is $5 for adults and $3 for children ages 6-12. It’s free for those under the age of six. You can catch it at the former Beekman bank at California and Third Street. Tickets can be purchased there. 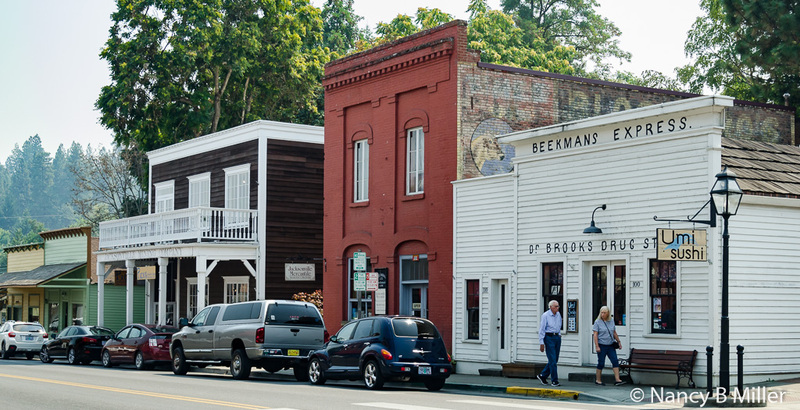 The tour passes historic homes, commercial buildings, the old prison, city hall, and churches. You’ll see where gold was discovered, Britt Park, and the Beekman bank site. You’ll learn about pioneers such as Peter Britt and Cornelius C. Beekman. Peter Britt came because of the gold. When that didn’t pan out, he returned to his passion for photography chronicling Jacksonville’s early people, architecture, and events. His work led to Crater Lake becoming a national park. His home was built in 1860 and burned down in 1890. His former estate is home to the Britt Festival, a summer long, open air concert series held from June through September. The amphitheater has seats for 200 with standing room for 2,000 people. It includes a 3-weekend Classical Festival. Pre-concert music, at no extra charge to concertgoers, is included before most concerts. Bringing picnic baskets is invited. Prices and shows vary so it is best to check out www.Brittfest.com for the schedule. 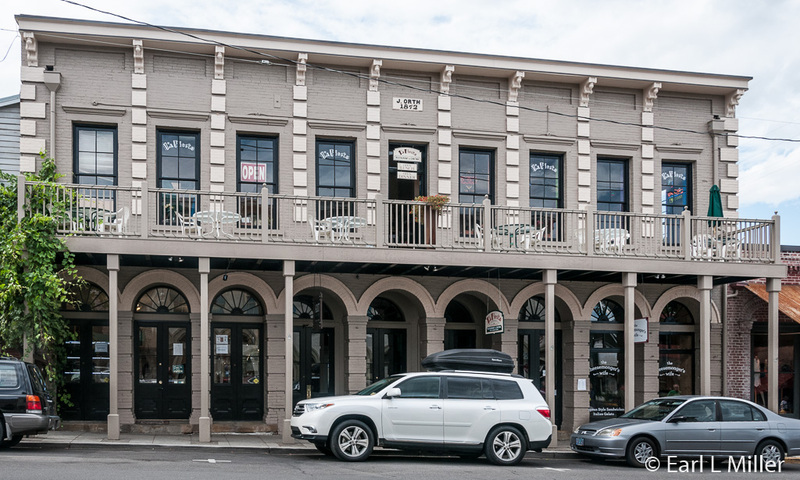 Cornelius C. Beekman, who also started his career in gold, opened in 1857, Southern Oregon’s first bank and the second oldest financial institution in the Pacific Northwest. It was one of the few wooden commercial buildings to survive Jacksonville’s 1870 fire. 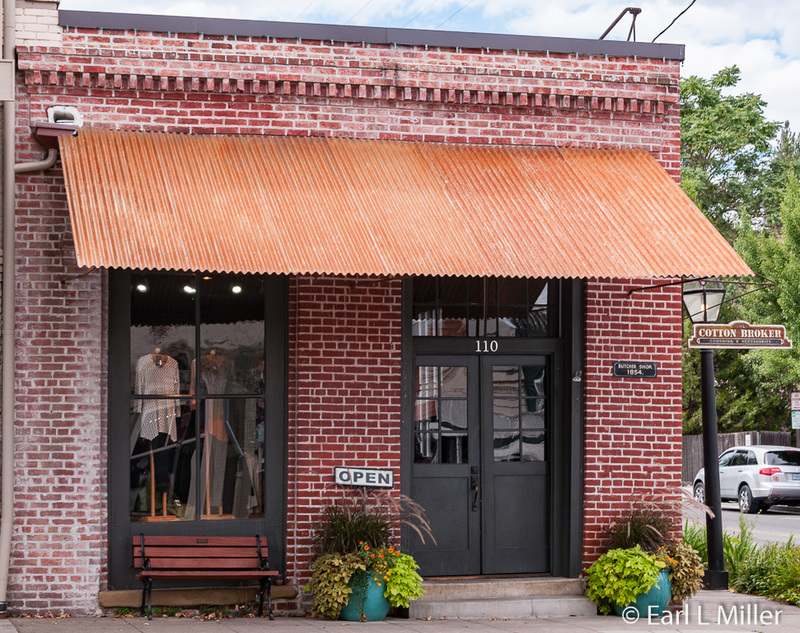 In 1878, a law passed stating new construction had to be brick. He also ran the Beekman Express where he bartered and traded for goods. A sign on the building today says Wells Fargo. Beekman also used the Beekman Express structure as a “gold dust office.” Instead of paying interest on the various accounts, he charged storage fees for the gold. By the time he constructed the current Beekman Bank Site, in 1863, it’s estimated that some $4 million in gold had passed across his counters. By 1912, the Bank of Jacksonville provided competition for his bank, most businesses had moved to Medford, and new banking regulations had been introduced. He closed his bank but continued to operate for his old customers until 1915, the year he died. The bank’s doors were closed when he died. Today the bank building remains as he left it. You can peer into a “Viewing Room” daily from the front, side, or back windows. You can see a desk, ledgers, and bank scales. On the second Saturday of the month from May through September, guided tours are provided. The Beekman House dating to 1873 will be pointed out to you on your tour. No family other than the Beekmans have lived here. In the 1960's it was turned over to the Historical Society and is now open the second and third weekend of each month. You will also pass the Chinese Quarter. This was the first Chinese area in Oregon. 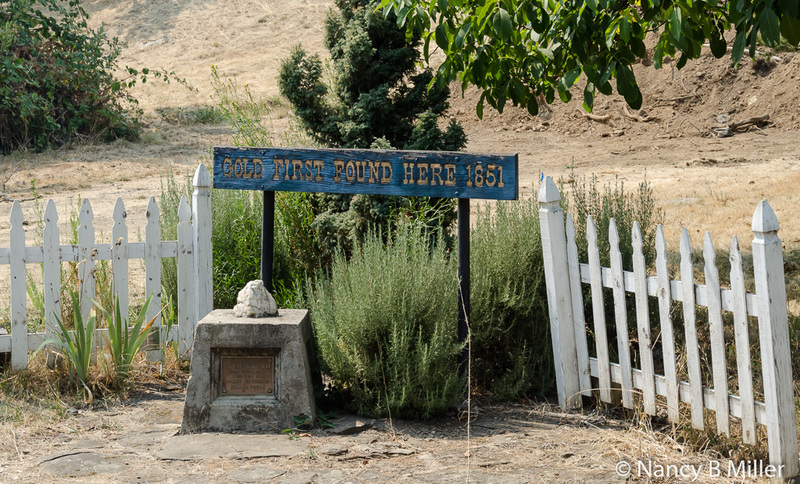 During the rough and tumble Gold Rush days, it was the scene of gambling and opium dens. Today you can see a fountain that honors the Chinese and Jacksonville has an annual Chinese New Year’s parade that is held each February. At Veterans Park, you’ll spot a statue of a World War II soldier kneeling for a drink of cold water. This is the town’s memorial to Veterans. The Judge Hanna house dates to 1870. The father and son were prominent judges. It was occupied by Hanna families for nearly 100 years. Another home you’ll pass is Judge Colvig’s constructed in 1870. His son Vance was the first Bozo the Clown. Vance worked for Disney and did the voices of Sleepy, Grumpy, Pluto, and Goofy. 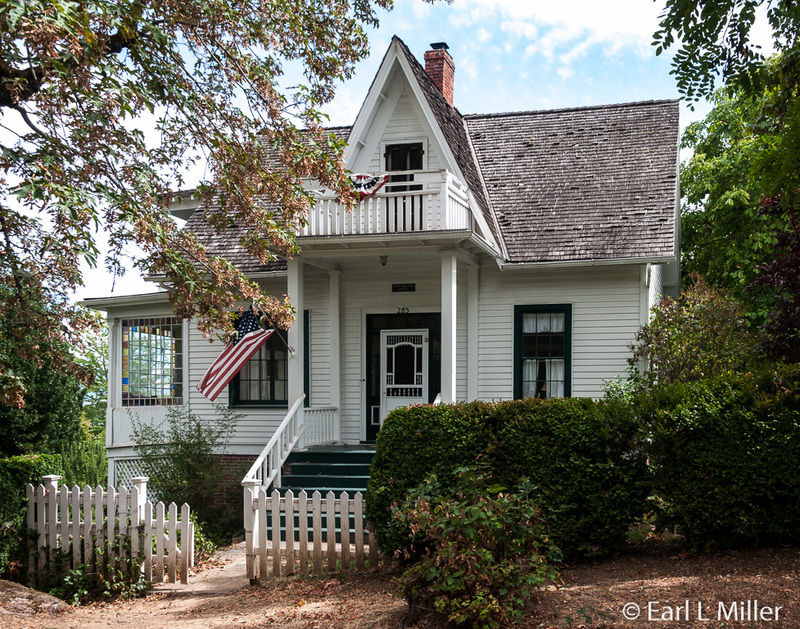 You’ll pass the large home of Jeremiah Nunan, constructed in 1890. Nunan was a prominent merchant. 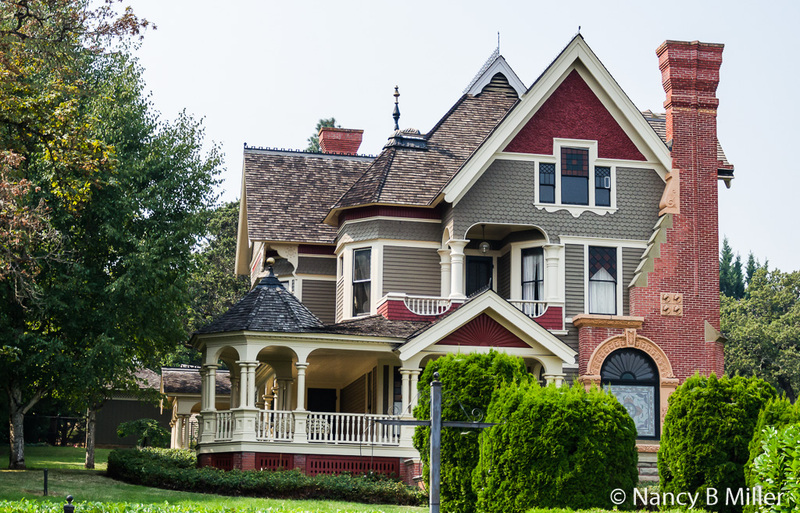 The plans and materials for this Queen Anne residence were ordered from a catalog in the East and delivered by train. There is stained glass throughout the home and five fireplaces, each made from exotic hardwoods. To the right of the home is the carriage house which has been a restaurant. The home was used as a bed and breakfast at one time. There are possible plans to reopen the home as a hotel. On the main street, our guide pointed out the U.S. Hotel built in 1880. It was built by George Holt to fulfill a courtship promise to his fiancee, Madame Jeanne De Reboam. Among the first guests were President Rutherford B. Hayes and General Sherman. Today a portion of it is a recreated branch of U.S. Bank with museum exhibits on 3rd Street Southside. We stopped outside St. Andrews Methodist-Episcopal Church. 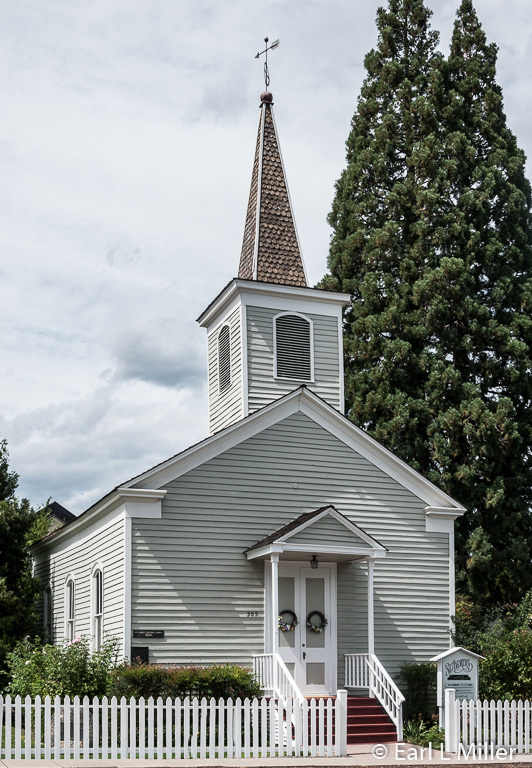 Built in 1854, it’s the oldest church south of the Willamette Valley. On alternate Sundays, it was shared by the Presbyterians and five other denominations for 25 years. Another church we saw was St. Joseph’s Roman Catholic Church dating back to 1858. The first service was held in 1860. In the early years, it was a center for many missions. It contains the original pump organ. 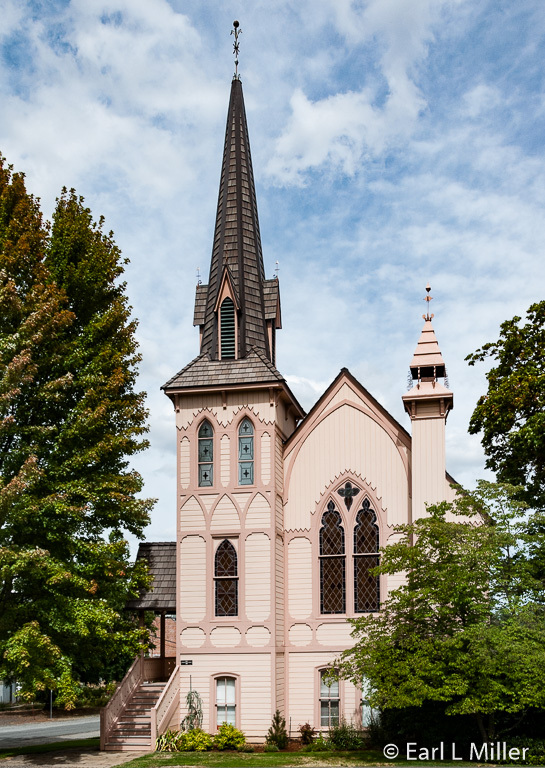 The tour also stopped by First Presbyterian Church, built in 1891 from sugar pine hauled from Roseburg. Its stained glass windows, which Beekman donated, came from Italy via Cape Horn. Combined into one block are three buildings. The Brunner Building, constructed in 1855, is the oldest surviving brick building in Jacksonville. It was a general merchandise store. Next door is the Orth Building, 1872, which was a popular dance hall and hotel. The last store was the butcher shop, 1854, owned and operated by John Orth. 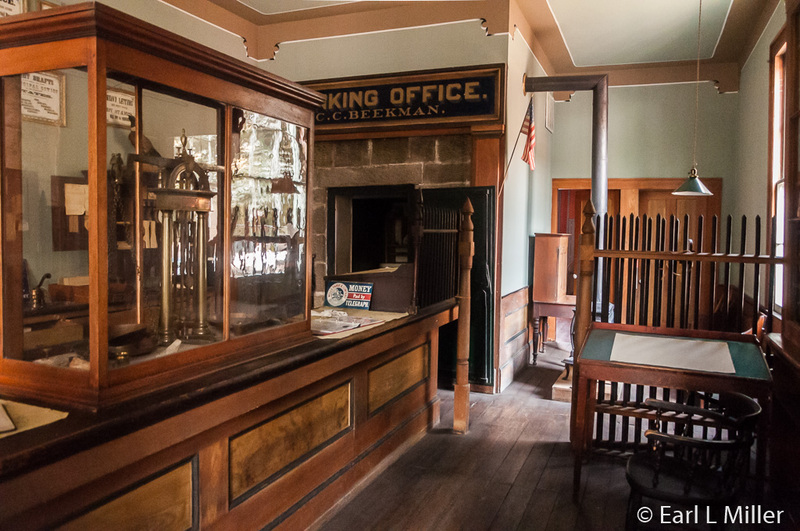 It served as the first post office in 1862. We were so delighted with the atmosphere that pervades Jacksonville that we came on two different days. On our first day, we took the trolley tour. A week later, we photographed many of the landmarks we had seen. We finished off that day by stopping at Scoop Shop which offers excellent ice cream. 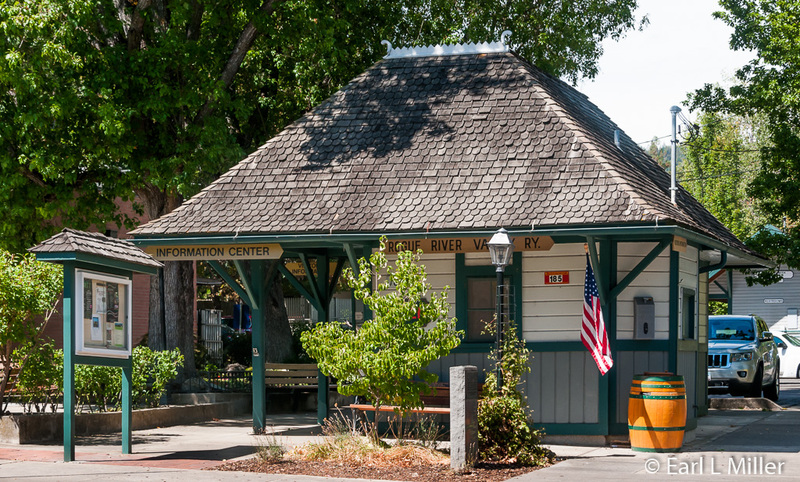 If you go to town, stop by the Rogue River Valley Railway Depot, built in1891, which is now the Chamber of Commerce office and Visitors Center. The railroad line ran between Jacksonville and Medford until 1925. The fare was a quarter. Be sure to obtain the “Historic Landmark Walking Map” which points out all 101 historic buildings. 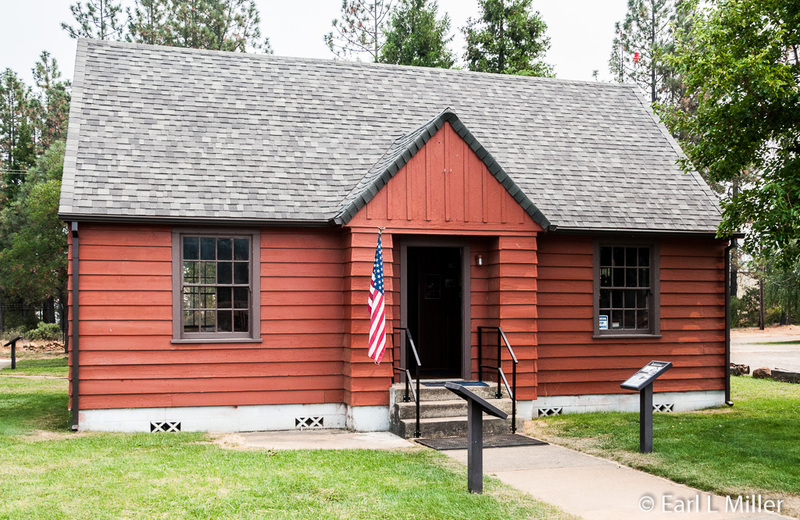 Located at Cave Junction, though no long active, Siskiyou is the site of the oldest standing aerial firefighter base in North America and includes the oldest smokejumper parachute loft. You can also tour the mess hall and dispatch. 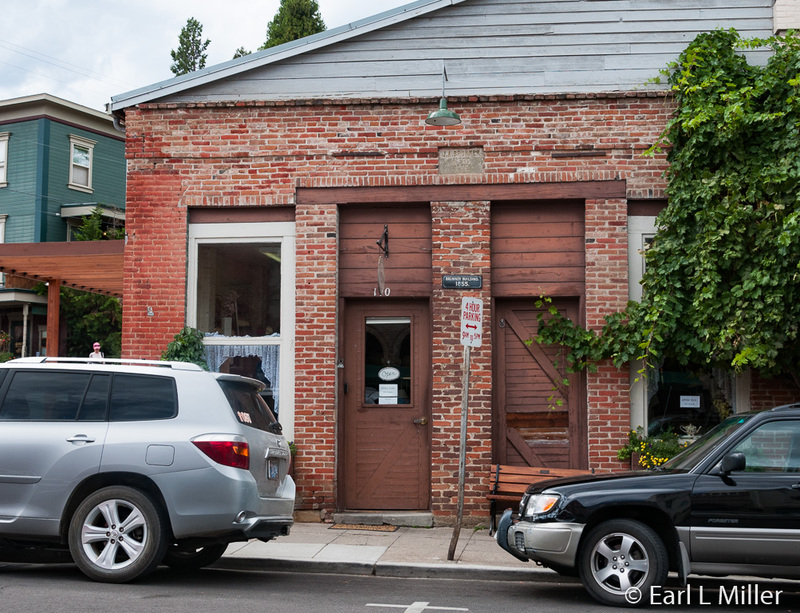 Each building is listed on the National Register of Historic Places and leased from Josephine County. All structures have been renovated by a group of 200 ex-Cave Junction Smokejumpers and local volunteers. The exhibits, housed inside the three buildings, tell the story of early U.S. Forest Service aerial wildlfire suppression. The base was a response to various attempts by the Japanese during World War II to cause panic by igniting massive fires in western forests. It started in 1943 as one of four primary smokejumper bases in Montana, Washington, Idaho, and Oregon. The Japanese sent 9,300 balloons which caused no fires because of the damp and cold weather. On a day trip to Klamath Falls, Elsie Mitchell and five children died when they examined a balloon and it exploded. These were the only casualties. The balloons had been a government secret. After the Klamath Falls incident, everything was found out. The first men who manned the base were conscientious objectors who by “religious training or belief” could not join the armed forces. More than 12,000 men were drafted under this provision. The Mennonite, Brethren, and Quaker churches agreed to administer the camps for all men assigned to them and to pay all the expenses. The work was usually in soil conservation, construction or forest fire suppression. These were known as CPO camps. One of the men in camp, Phil Stanley, suggested to the U.S. Forest Service that they would make good smokejumpers. 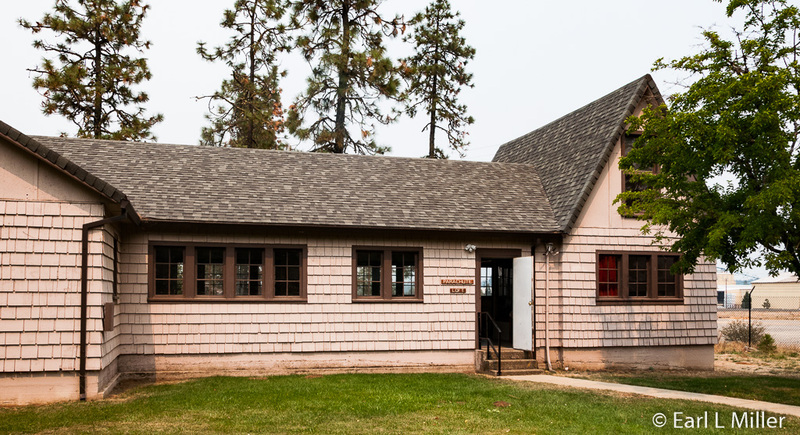 In May 1943, the Mennonite Church opened a CPO camp in Missoula, Montana. Sixty men trained the first years in parachute jumping and fire fighting. Seven men were sent to Cave Junction. In 1944, the number increased to 120 with 12 of them going to Cave Junction. Originally the smokejumpers used whatever plane they could find. The crew took four minutes from the moment the siren sounded from dispatch informing the smokejumpers about the fire to when the pilots took off. Planes included a Nordyne, a Beechcraft, a DC-3, Twin Otter, and Ford Tri Motor. The base continued, after the war, until it was closed in 1981 in an effort by the Forest Service to centralize resources. Over the years, 39 crews were dispatched to thousands of lightning and human-caused fires throughout the western states. Although the tour can be self guided, you will often find volunteers who were former smokejumpers. Our guide, Dave Laws, jumped for five years. Willi Unsoeld was a smokejumper in 1958 for a year. He gained fame for achieving the first ascent of the West Ridge of Mount Everest in 1963. He died in an avalanche on that mountain. Danny On was the first Asian smokejumper. He served in 1946. He was a former paratrooper for the 101st Airborne. 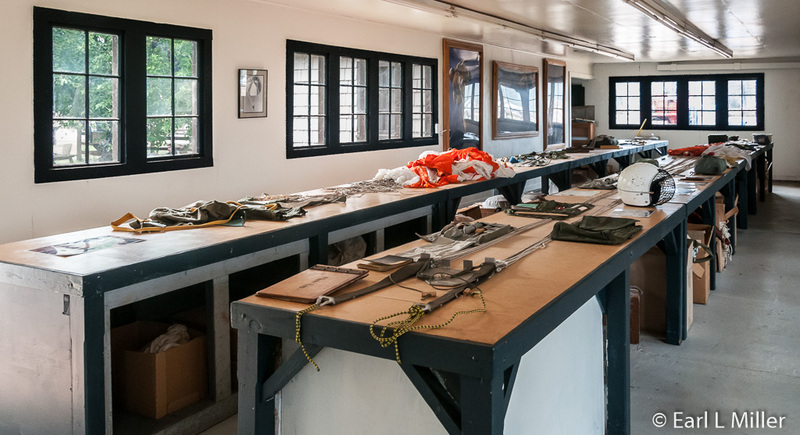 The Parachute Loft has several rooms containing the actual equipment they used. 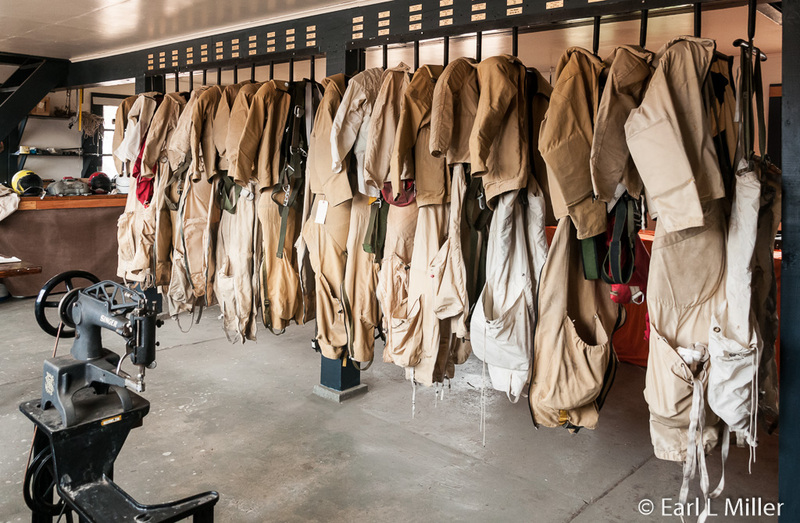 You’ll see packed parachutes, jump suits, firefighting tools, and sewing machines they used to repair the chutes. Several helmets, including a rare leather one, are displayed. 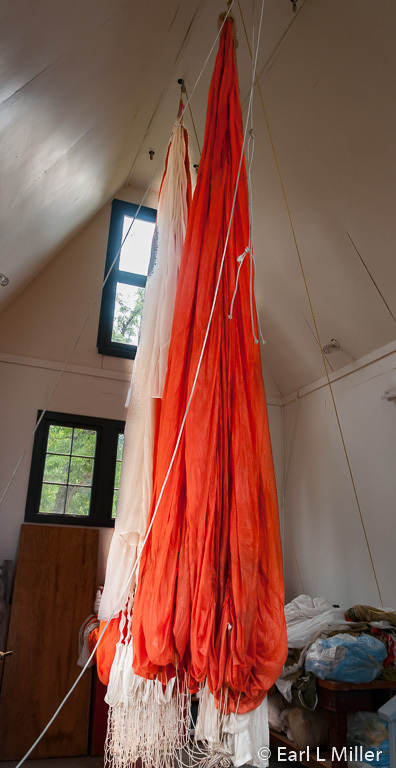 Off the main room, you’ll see parachutes hanging. This is where they inspected the suits for damage. The men would take all the support materials they needed when they jumped. Later, they would call the base for more equipment including fire retardant. When they were through, they headed for the nearest road. A vehicle would pick them up and return them to the base. The mess hall contains their gift shop. It was formerly the cook’s apartment and the kitchen. 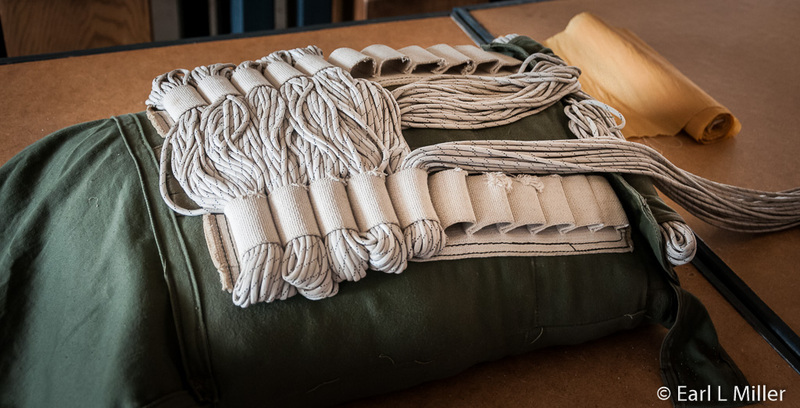 You’ll also see exhibits on smokejumper training and Oregon’s first smokejumpers. Admission is free. It’s located at 30902 Redwood Highway, four miles south of Cave Junction at Illinois Valley Airport. The telephone number is (541) 441-4804. It’s open March 15 to November 15.